At the end of each month, we round up the top sewing projects. These are the ideas readers loved from the newsletters, the site or they found via Facebook post or tweet. Our newest social media obsession is Pinterest. I don’t know about you guys, but I find this site to be extremely addicting! Since we’re constantly sharing new project ideas through each of these outlets, it can be challenging to keep up with it all. We’d hate for an awesome idea to pass you by! Today, I’ve pulled together some recent sewing trends and ideas so you’ll be all caught up with what’s hot in the online sewing universe. 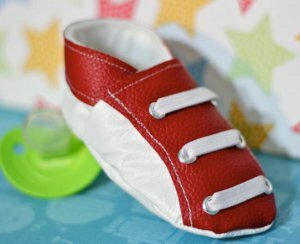 Maureen Wilson shared a photo of the baby sneakers she’s working on. 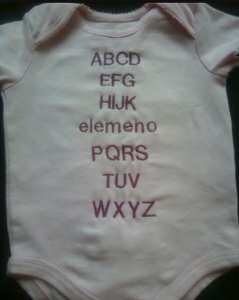 Teresa Sanders-StPeter Puleo machine embroidered this onesie for her grandchild. 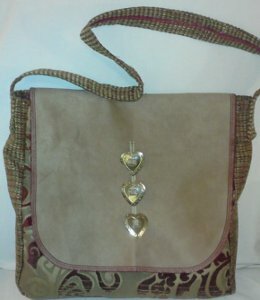 Beth Glawitsch Shirley made this bag in only a few hours and all from upholstery samples. I hope you’ve found a few new ideas to try! You can join in our Facebook conversations by becoming a fan, and follow us on Pinterest to discover ideas we’ve found from all over the blogosphere. Subscribe to the Sewing It Up newsletter to find all the latest projects, keep up with our giveaways and more. Since we can’t get enough of Pinterest, we have to ask: Are you addicted to Pinterest too?